Work on the final MA project is progressing well and the final piece is starting to take shape. The following images hopefully help to illustrate the final concept and form the work will take, although development is still taking place. The final piece will explore particle physics through art. What I am trying to convey is the concept that everything is made from small “particles” of different elements, that form into matter but eventually return back to the initial state.What I am trying to create is a visual metaphor to show that everything is made from these small building blocks including ourselves with the aim of provoking thought on the subject and theories of particle physics . 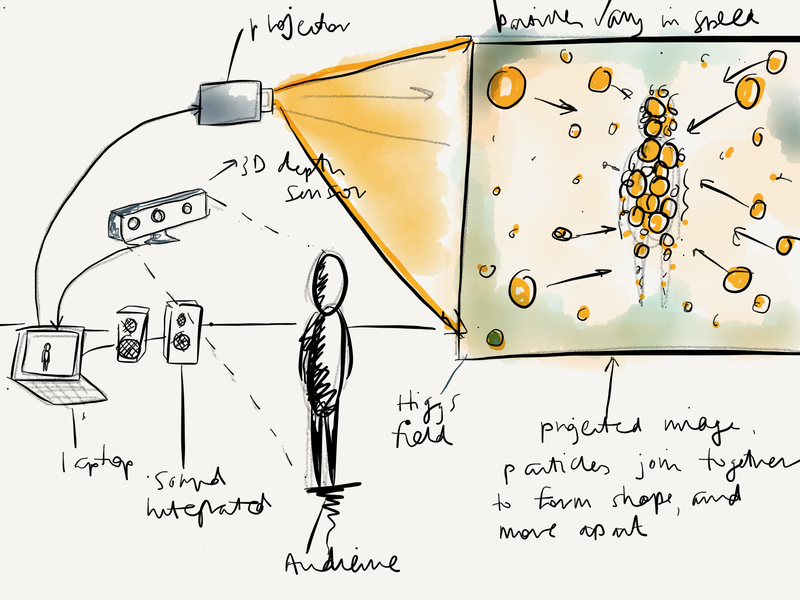 The above image is a page from my sketch book that illustrates how the user will interact with the piece. I am aiming to exhibit the piece at the Fusion in Norwich in the coming month or so, alongside the final MA show at Norwich University of the Arts at the start of September. I have the opportunity of using one of three spaces for the final MA show. 2 are square-shaped rooms and the third is an L-shape. These are still in negotiation but I think a square room would be the best way of exhibiting the work. In an ideal situation this work would be a fully immersive projection, but for the final exhibition I will be producing a slightly scaled back piece or work. In the above illustration I require a min. of 1.2m² space for the Kinect technology to work. 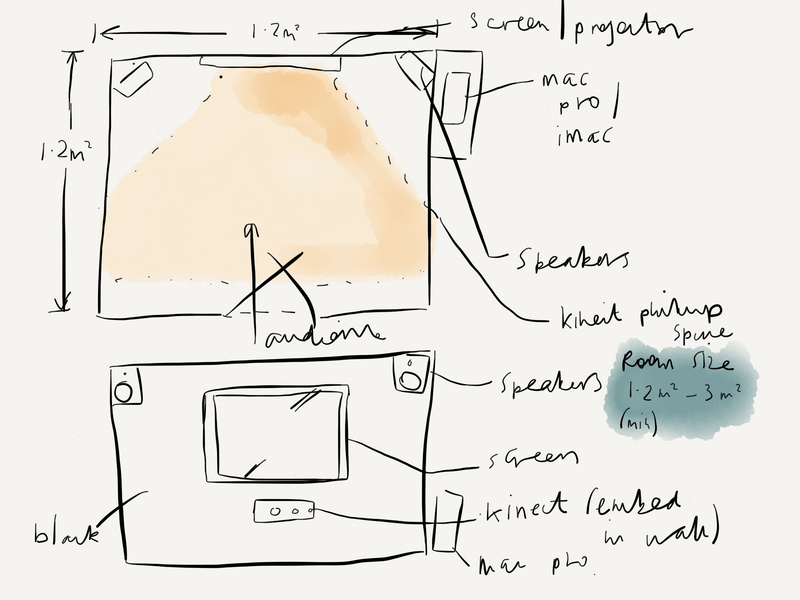 The room will consist of a 50″ display and a Kinect camera embedded in the wall, alongside a pair of mounted speakers. This will all run from a Mac pro which will be hidden in the wall. As the work will be running for a week reliability is key, hence a powerful machine. The above videos illustrate the work in its current state. For technology demonstration purposes, I utilised some music created by my friend Chris Weeks and used some (currently) unlicensed demo software, z-vector in conjunction with other software tools. After discussion with both my tutor and Dr.Lincoln, it has become apparent that although the piece looks interesting, it is lacking a clear scientific link. I am going to discuss some of the theories I have been exploring in a future post, but for the time being it was suggested by Prof. Hanna that I think about how I can make the link clear for the audience. Two possible ways to address this would be via either image or sound. I don’t want to be obvious and utilise text, so I thought of combining the interactive image with some pre-recorded material or through using pre-recorded quotes in the soundtrack. I am currently organising a short visit to QMUL to meet with a specialist to help develop the related theory the work is based upon. The work isn’t there yet, although I feel it is progressing well. I have a tight schedule to keep over the next couple of months in preparation for the final MA show in September. The work still needs lots of further visual refinement, I am starting work on the sound shortly. With conjunction with the advice and guidance I am receiving it is heading in the right direction and am happy with the progress being made.